Setaria geniculata (S. parviflora) in bloom.Courtesy W. J Hayden,.University Richmond.chalk.richmond.edu (Accessed 6/2014). 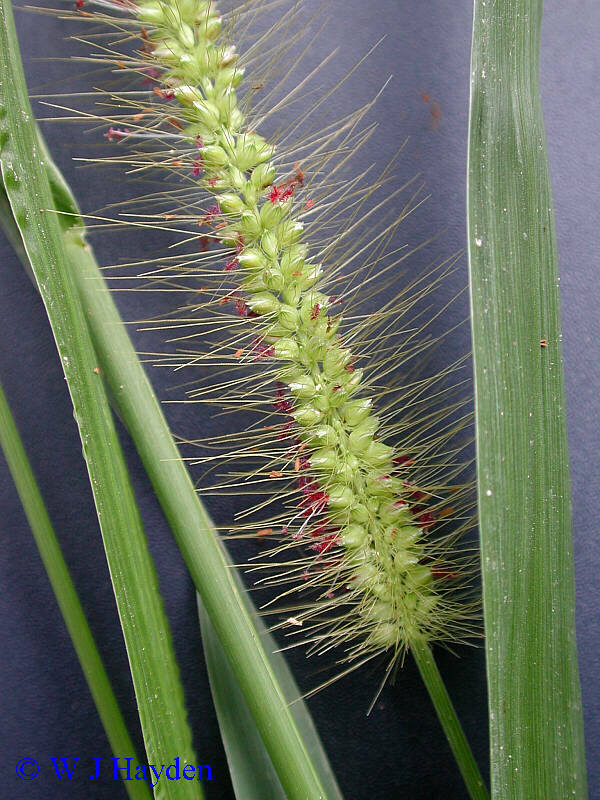 Setaria parviflora is a perennial, C4 grass (Rubio et al. 2010) 0.30 to 1.2 m tall, sparsely colonial from knotty short, branching rhizomes or stolons to 4 cm long, stems slender, wiry at base (Hitchcock 1950), 1-several; sheaths smooth. Leaves to 25 cm long, 0.2-0.8 cm wide, raspy textured above. Flower spikelets 0.2-0.3 cm; inflorescence spike cylindrical, 3-10 cm long, green to yellow-tan, axis hairy, bristles below each spikelet 4-12, 0.2-1.2 cm long, finely barbed, yellow to purplish, spreading outward; July-Oct.
Habitat: Moist to dry, open habitats, salt marsh edges.